A man convicted of manslaughter after stabbing a friend during a fight has had his prison sentence increased from six to eight years on appeal. Kristian Bailey, 28, stabbed Joe Jennings five times while the two were sharing heroin in Yeovil on 14 July 2018. 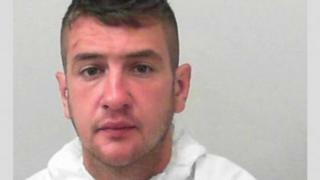 Bailey was convicted on 23 January after a trial at Bristol Crown Court. Solicitor General Robert Buckland said "increasing the length of the sentence was necessary for justice to be done". Mr Jennings was found by an ambulance crew with multiple injuries in the stairwell of flats at Great Western Terrace at about 23:15 GMT but died despite attempts to save him. Bailey had already fled the scene before disposing of the knife. Speaking after the appeal hearing Mr Buckland said: "I hope that this brings some comfort to the victim's family." Bailey had been originally accused of murder but was then convicted of the lesser charge of manslaughter by a jury.